The beanie is back, dun dun daaaaa and I am not sure I am so keen this year. I am more feeling the bobble hat, especially after I saw some fabulous ones in Stylist Magazine yesterday – black bobble hat here I come. Adding a hat changes a whole look of an outfit, beanies add an edge and a fedora adds some class – that kind of thing, you know? Well clearly this outfit was needing an edge, overall rather a simple look except for my fabulous panelled Topshop jeans. 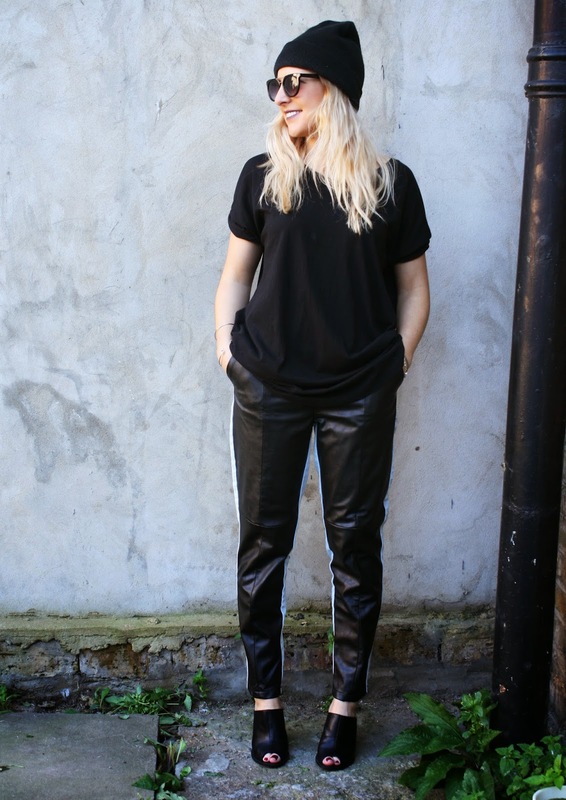 The back is a light wash denim and the front is leather – 2 of my favourite things in one pair of trousers, god Topshop you genius. 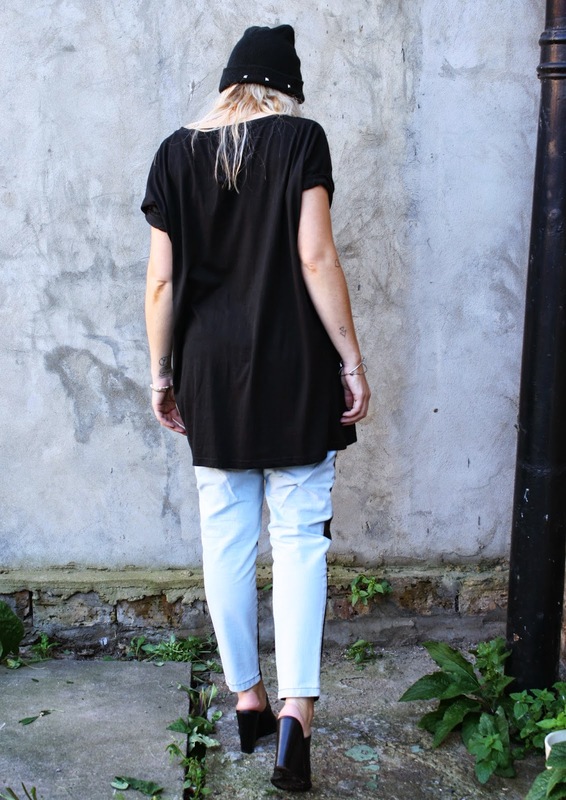 The wedged heels add a bit of height and the black tee keeps the outfit understated. The open toed heels are actually off to be packed away now as its full blown Winter here in London. This means the hunt shall begin for a pair of Winter ‘going out shoes’ – warm party shoes, are these possible? Maybe a shoe boot, a cool shoe boot – any suggestions guys? i love beanies they're so great for the colder months, great photos! I do love a good beanie, although think I should invest in a fedora too! I'm excited to be able to wear beanies again. I've been falling more and more in love with hats in this last year. You're right they really do add something extra to an outfit. Love this outfit - those trousers are amazing! Totally agree with your hat thoughts!! 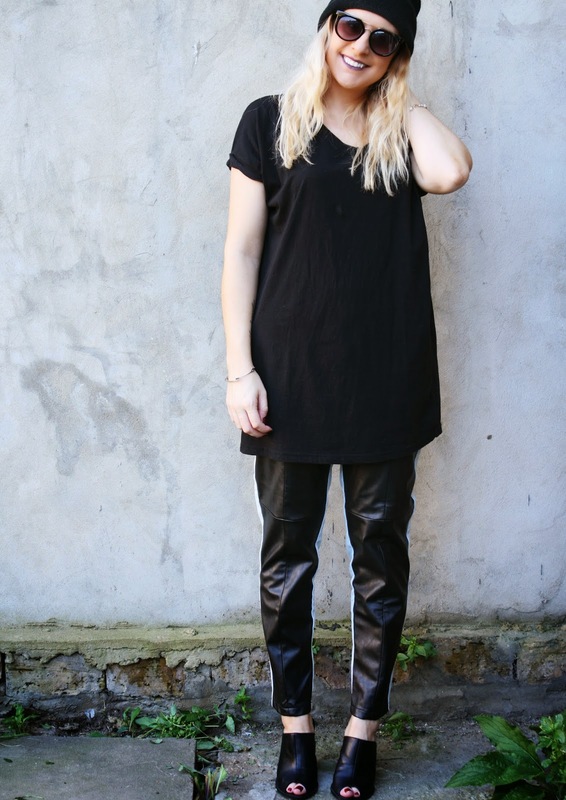 leather joggers/trousers! how very kanye of you :) love the panelling!